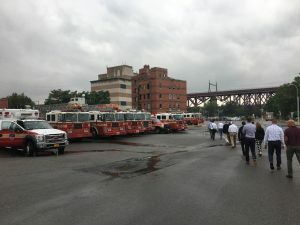 For mid-career leaders, this two-week program based at Fort Hamilton and other locations in New York City, helps participants understand the complex makeup and critical issues of operating in dense urban areas and megacities. As the trend of the world’s population continues to become increasingly concentrated into dense urban areas and megacities, the importance of understanding them is a critical component of global security and preparing for the future’s uncertainties, including humanitarian assistance and disaster relief scenarios. The IDB DUS Strategic Broadening Seminar is an educational and experiential learning opportunity for students to explore and understand the critical infrastructures and urban geography and flow of cities, the technological and physical connectivity of city networks, and the culture and behavior of people and their environment. Learning takes place both in the classroom and through on-site visits with local authorities, agencies, private companies, as well as terrain walks. Experiential learning occurs through site visits with local academia, government, authorities, agencies, and companies in New York City. The faculty members and speakers for this program come from academic institutions such as New York University’s Robert F. Wagner Graduate School of Public Service, John Jay College of Criminal Justice, Emory University’s Goizueta Business School, Duke University’s Sanford School of Public Policy; also, the private sector, and the U.S. Military and Government. Government sponsored students are either centrally funded or funded by their units. The sponsoring entity normally selects the students and submits an application package to be approved by the IDB. If you are interested in sponsoring yourself, please contact the program office for more information. Taking place on Fort Hamilton in Brooklyn, NY, and using the city of New York as a laboratory, the IDB DUS SBS is an academic, intensive, two-week in-residence program. The program operates in a fast-paced environment, where classes, exercises, and site tours are held five days a week. You will have the opportunity to challenge the thoughts of your fellow peers, world-renowned academics, speakers that are experienced professionals, but most importantly, you will have the opportunity to challenge yourself. Students can expect three full days in the classroom at Fort Hamilton, as well as other classroom sessions interspersed throughout the program. All of our faculty and speakers use various learning tools and styles. Professors may lecture on topics to provide the big picture theories and follow with a hands-on learning activity or they may provide a discussion-based atmosphere for students to discuss among themselves and with the professor. Classroom sessions may also feature breakout exercises to examine specific issues more in-depth and then return to present to the entire class. In class sessions at Fort Hamilton normally wrap up by 5 pm with a few later exceptions when returning from location visits in NYC. Off-site visits are essential to the IDB DUS SBS. The class will visit with private sector companies, influential speakers, city agencies, and federal agencies, in addition to tours of infrastructure in the boroughs of Manhattan, Brooklyn, and Queens. Students are expected to fully engage with the program. Faculty often distribute pre-reads (in the form of articles and/or books) in order to help students prepare for their classroom session. Laptops and electronic devices are strongly advised as there will be digital documents distributed every night. The IDB DUS SBS culminates in group presentations before a panel on the final day of the seminar. Students will work with their groups on a topic assigned early on in the course in order to prepare their presentation. During the two-week program, you will attend class up to seven hours a day with your fellow classmates, who are from all over the U.S. Army and other participating organizations. Whether it’s working in small groups, both inside and outside the classroom, having a discussion over dinner in Brooklyn, or navigating the NYC subway system, you will learn from one another through your experiences. The IDB DUS SBS academics, speakers, and site tour guides understand the value of this program and the impact it will have on you and your organization as you progress through your career. It is not uncommon for speakers to join the class for lunch and/or to share contact information after the conclusion of a site tour or classroom session and remain engaged with the participants.